The casting exposed by the Shakeout is too hot to handle. Thus, they are passed through a Casting Cooler to reduce their temperature. 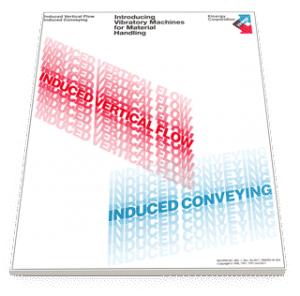 This can be a standard Vibrating Conveyor with a top cover that induces cool air to flow over the hot castings and exhaust out of the hooded cover. Another concept is to use a Fluidized Bed type of vibrating unit to force cool air into a plenum and up through the conveyed castings. For either scheme, the electrical control innately with the Kinergy Drive is used to adjust the retention time for cooling and the automatic and repetitive “pulsing” to keep the castings slowly moving without being stopped by any clogging in the trough. Since Casting Coolers usually have a long length, that kind of “Induced Conveyor” will consume area in the Foundry facility. When space becomes a factor, the use of Spiraled Casting Coolers should be considered. This kind of Conveyor has the advantage of providing the maximum amount of length in the least amount of space.